Carrots are orange, aren't they? Although carrot consumption is on the increase - quadrupling between 1976 and 2013 - many of us know very little about this ubiquitous vegetable. 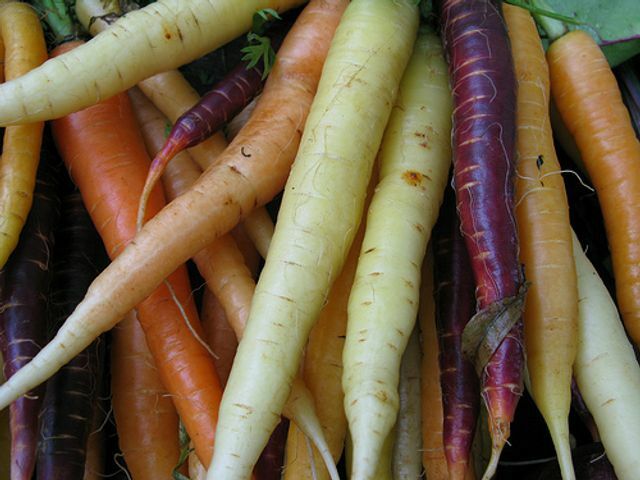 This may now change with researchers having sequenced the genome of the carrot, identifying genes responsible for the abundance of vitamin A, an important nutrient associated with vision. As vitamin A concentration is related to the orange colour, carrot breeders have worked hard to increase the colour intensity and thereby making the humble carrot more nutritious. Interestingly, wild ancestors to today's bright orange variety were white, whilst purple, yellow and red hues are also grown across the Middle East and Asia. "Carrots are an interesting crop to work on because of their wide range of diversity. They are familiar to everyone, and generally well-regarded by consumers, but like most familiar things, people don't necessarily know the background stories," said University of Wisconsin horticulture professor and geneticist Phil Simon, who led the study published in the journal Nature Genetics.